Little-known fact about Boston: there are an inordinate amount of hangovers in this city. Tons of universities means tons of students, which means tons of pounding headaches around town on the weekends (OK, and some weekdays -- lookin’ at you, T’s Tuesday). 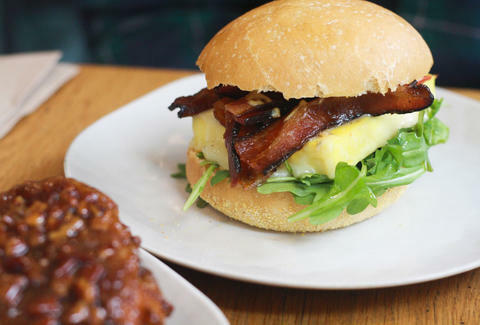 Combine the disproportionate student population with all the city’s young professionals making similarly beer-soaked life choices, and it’s a good thing that Boston is practically brimming with heavenly breakfast sandwiches. Of course, the wickedly hungover haven’t cornered the market on being hungry in the morning, and these breakfast sandwiches are damn good any day of the week, even when you’re not dehydrated and trying to decode last night’s texts. If you can stomach saying the word "tequila" after a night out, you’ll want to head to hip coffeehouse Pavement for its revered Tequila Sunrise. This delicious, zesty egg sandwich is topped with jalapeño cream cheese, crispy bacon, tomato, and red onion, and it’s one of the best hangover cures known to man. 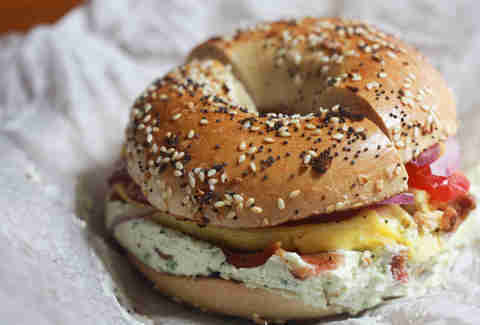 We suggest ordering it on an everything bagel for an even bigger pop of flavor. The egg sandwich at Sofra is emblematic of the bakery itself: warm, comforting, and inspired by the tastes of Turkey, Lebanon, and Greece. 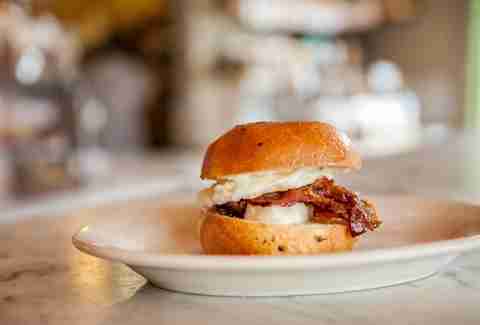 This tasty creation is made with halloumi cheese, spiced feta butter, and crispy bacon (if you so choose -- and you so should), and served on a buttery, house-baked brioche bun. The halloumi, a sheep’s-milk cheese from Cyprus, gives the sandwich a rich, savory bite and a slightly creamy texture. It’s ill-advised to leave Sofra without a couple of pastries, too, so be sure to grab a piece of chocolate-hazelnut baklava, or the weekend special, a tahini brown butter donut with salted caramel ganache. Yeah, go ahead and just let those words roll around in your mouth for a second. The real thing’s even better. You can always count on the Good Ol' Breakfast Sandy at Trina’s to sate your AM starch cravings. You know the old hair-of-the-dog theory? It’s only half true: if you were out at Trina’s tossing back craft cocktails, coming back here in the morning really will kill your hangover. Served on a delightfully flaky buttermilk biscuit, this sandwich combines two eggs over easy with cheese and your choice of bacon, sausage, or chipotle-tomato jam. Better yet, ask for both bacon and jam -- that decision is just good for the soul. Brunch at beloved cocktail hangout Deep Ellum is a revelation, not least because this place offers up a hearty, seven-days-a-week brunch menu. Diverging from its Southern theme, the standout is a Polish-influenced sandwich, made with house-smoked kielbasa, a fried egg, horseradish aioli, and Vermont cheddar on an English muffin. 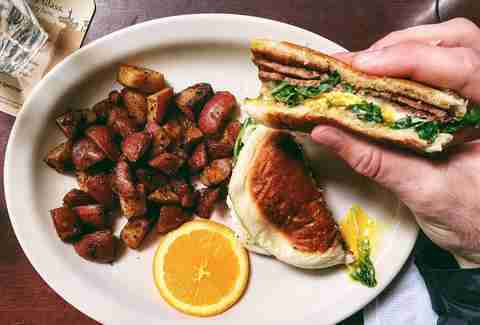 This sandwich’s bold flavors pair beautifully, and come with a side of nicely crisp home fries, too. Pair it with a vodka-based cocktail and you’re all set. A small, buzzy shop nestled into Brookline Village, Cutty’s is the patron saint of breakfast sandwiches, offering up delicious variations, from Thai sausage to an eggs-Benedict-wich. However, we recommend going old-school: order the classic Cutty’s Egg Sandwich, composed of eggs whipped with butter, sharp cheddar cheese, and either a spicy Sriracha aioli, truffle ketchup, or red-eye mayo. It all comes served on local carb god Iggy’s black pepper brioche, and you have the option to toss on bacon, ham, sausage, or Swiss chard, too. The husband-and-wife-led team at Cutty’s makes many of the ingredients in-house, so you’re in for supreme freshness. Even noted car-driver Guy Fieri approves of the sandwiches here. Whether that makes you want to visit more or less is your prerogative. Mike & Patty’s is a classic mom & pop spot, serving up a sandwich-only menu for breakfast and lunch out of a quaint and cozy (we really mean cozy -- there are, like, six seats total) corner shop in Bay Village. The menu is written on paper plates stuck to various surfaces and walls, so to save you the embarrassment of scanning them all like a noob and holding up what’s sure to be a long line, go for the Fancy. This sandwich is a thing of beauty, loaded with two fried eggs, bacon, cheddar, avocado, red onions, and house-made mayo. Best of all, it’s served on lggy's toasted multigrain bread. 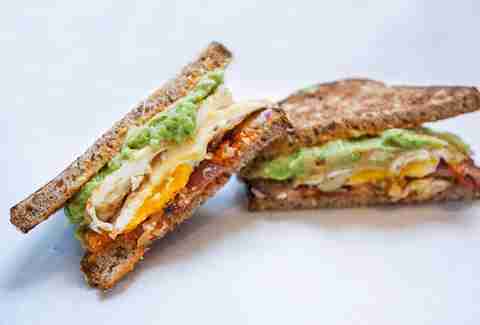 All hail culinary queen Joanne Chang, chef & owner of Flour and the mastermind behind this sensational sandwich. 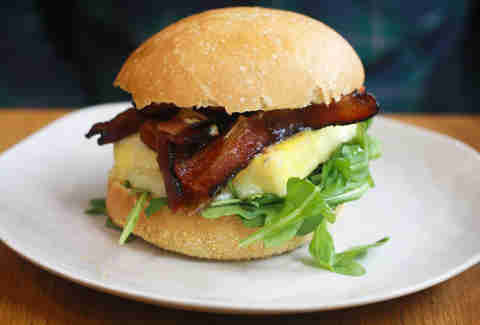 A thick slice of what is essentially a fluffy egg souffle is placed on a freshly baked focaccia roll and topped with cheddar, roasted plum tomato, a heaping portion of arugula, applewood-smoked bacon or black forest ham, and -- last but not least -- dijonaise. That final ingredient gives the sandwich an extra tangy kick that sets it apart. While you’re here, you should balance all that savory goodness with a sweet and plump sticky bun; Chang is famous for these, and for good reason. 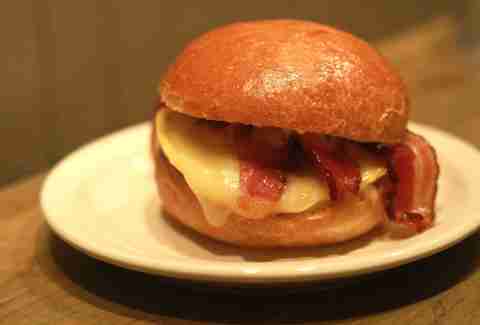 This artsy JP cafe contains a hidden gem in the form of the breakfast sandwich. It may look simple, but take your first bite, and you’ll immediately be blown away by the unusual maple-rosemary sauce, which is drizzled on farm-fresh egg, sharp white cheddar cheese, and (optional, but not really) crispy cherry hardwood-smoked bacon -- all served on a daily baked brioche roll. It’s soft, rich, and among Boston’s best breakfasts. Whether you’re walking from your apartment or trekking out to JP on the Orange Line, you’ll be glad you made the trip. Bonus points for pairing it with Ula’s New Orleans iced coffee. Tom Vellner is an associate staff writer at Thrillist and a BU alum. He begins all meals with: "In the name of the bacon, the egg, and the cheese. Amen." Follow him on Twitter @tomgvellner.